We've all been there. That feeling of not being able to sleep, or concentrate, or feel a sense of inner peace. Whether it's because of problems at work, issues in your relationship, or things going on in the news, it's easy to feel anxious about what the future holds for you. This is a time when many people decide to turn to the Tarot. Tarot cards have been used for centuries to give people peace of mind in times of uncertainty. There are many people who don't know what Tarot is, or worse, are fearful of it. Rest assured, there's no need to be scared of this ancient divination! Think of a Tarot as a tool for healing, one that gives you guidance for any situation in your life. First, you must ask a question. The Tarot cards are shuffled and arranged into a pattern with each position in that pattern relating to a specific aspect of your question. 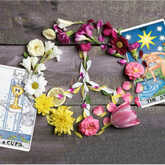 The symbols on each Tarot card are then analyzed to give you insight and advice based on the question you asked. If you're ready to give Tarot a try, get started below! If you've revealed the meaning of your first three cards and need additional insight, you can by getting a full Celtic Cross reading! All you need to do is choose the remaining seven cards just below your spread. It helps you make sense of the world around you. Hearing about natural disasters, acts of violence and terrorism, or other saddening current events can leave you feeling powerless and spiritually worn down. The Tarot puts you at ease by helping you understand what is happening, and the actions you can take. It helps you make sense of your own world. Sometimes the conflict doesn't come from things outside of your life, but the things happening inside of it. Maybe you've had a fight with a friend, or you're having issues in your relationship. Whatever it is, the Tarot will help you understand the forces at play, and how you can manage them. It gives you clarity on a particular situation. Sometimes it's hard to take a step back and see things for what they really are. You can't hide anything from the Tarot! It allows you to take a deeper look at all angles of your problem -- and even at yourself -- so that you can better understand what it is that has been holding you back, how you got to that point, and how you can break free from it. It offers advice for moving forward. Sometimes the hardest part of any problem is knowing how to fix it. In a Tarot reading, your Advice card allows you to not only have a deeper understanding of the problem you're facing, but it also gives you a solution for the best possible outcome. The Tarot can't see the future, but it can help you create a better one! It empowers you. Believe it or not, the path to a better future starts with YOU. While you may not have control over the things happens to or around you, you do have the ability to turn any negative situation into a positive one. Everything you need to fix your situation is within you, and the Tarot helps you see the natural gifts you already have that will help you heal. We all face obstacles at some point in our lives, but it's how we handle them that makes all the difference. Stop and think about what it is that's troubling you right now. Is it something in your love life? An unresolved conflict with a friend? Things in the news that are troubling you on a personal level? No matter what your source of discomfort is, the Tarot will give you exactly what you need for a happier future.